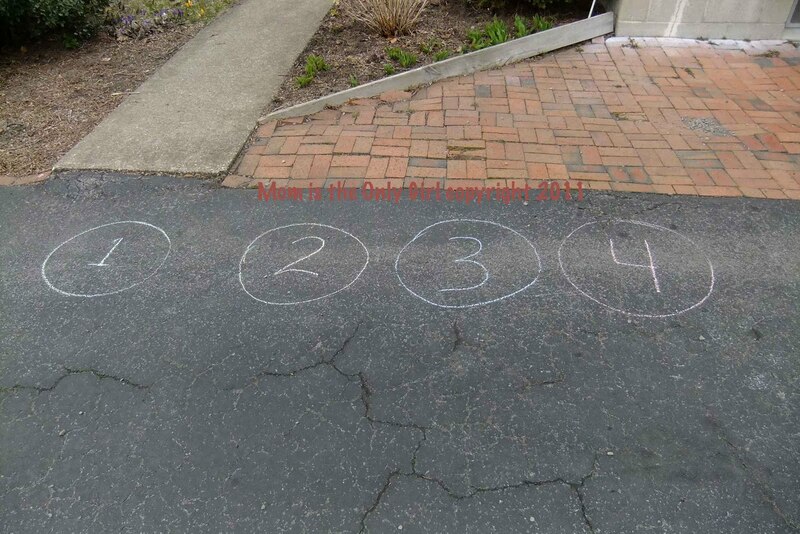 Cutie Pie made up this outdoor chalk game last May, when I originally posted about it, so I cannot take credit for it at all! Sweet Pea has been able to climb in and out of his crib for quite a while now, as long as the side is down. 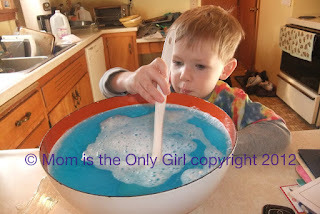 Hubby and I weren’t crazy about this, but he didn’t actually start this activity until he was able to do it confidently and seemed to only do it while playing with his brother. We weren’t really ready for him to wander the house alone at night like his big brother did when he got a toddler bed, and he didn’t climb in and out that often, so we’ve been putting off moving him to a toddler bed. I know, I know, safety first, right? The other morning I went to get my darling 3 year old out of bed and he refused to let me get him out of bed…he proceeded to climb over the rail while it was UP! I guess we waited too long! Needless to say, Sweet Pea is no longer our baby in a crib. I set up his toddler bed an hour or so after he got up! He’s definitely not been a baby for quite a while, but now he’s in a toddler bed and loving it. I’m also pleased to say we have not found him wandering the house at night, or sleeping on the couch when we come down in the morning. He’s only fallen out of bed onto the soft pillows and blanket once, the first night! My lesson from this: put safety first and your nightmares behind you. Your little one is growing up and keeping him in a bed that is potentially dangerous is not worth it. He’ll surprise you with his abilities more often than hiding them from you. I’m very thankful he didn’t fall and that I didn’t have to learn this lesson as a result of injury. Have you ever learned a lesson like this the hard way? 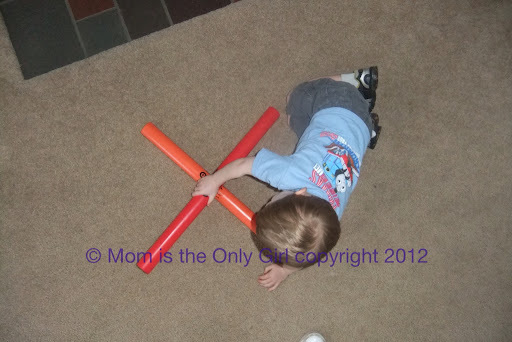 We were playing with the Boomwhackers a few days ago when Sweet Pea stopped making music with them, then suddenly ran into the other room. I followed and saw him laying them out ‘making letters’! I was so impressed and stood watching for a few minutes before running to grab my camera! As he created each letter he told me what he was making! All this time I was thinking he just wasn’t ‘getting’ letters! He had me fooled, don’t you think? 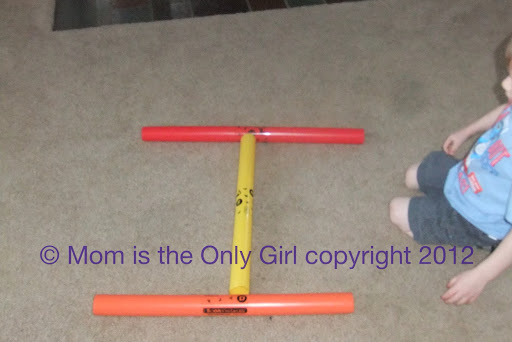 With this last one he said “This is a T for Tricia and that is you!” Lovin’ it! In addition to Sweet Pea’s latest obsession of changing into his PJs and then changing them as often as he can throughout the day, he’s also taken up sorting things. 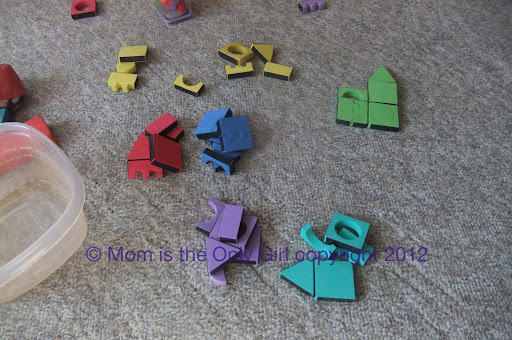 Mostly he sorts objects by color, and I’ll find little piles that he leaves behind when he plays. Sometimes he comes back and counts them with me, which is always fun to do together! Just for fun I left the colored blocks out one morning, hoping to catch him in the act, but it was almost like he knew what I was doing and never played with them! Little stinker! For the past several days Sweet Pea, my 3 year old, has been repeatedly going up to his room, getting into his clothes drawers and changing into his pajamas on his own. I mean, repeatedly, like 10 times throughout the day! He’s getting very good at putting pants and shirts on. Now if I can only get him to figure out how to put socks and shoes on by himself I think we’d be doing great! An instrument most people don’t get to experience, either hearing or touching, is bagpipes. I used to play the bagpipes through my junior high and high school years, but haven’t in quite a while and no longer own a set. 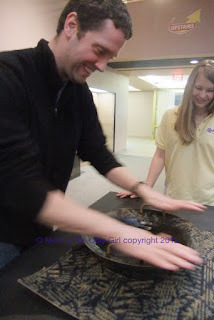 (The picture of me playing is too awful to share!) Fortunately for us, Uncle Craig still plays. The boys had the opportunity to hear them, touch them and try them on his visit last summer. If you’ve seen bagpipes in parades, you know they are quite loud. 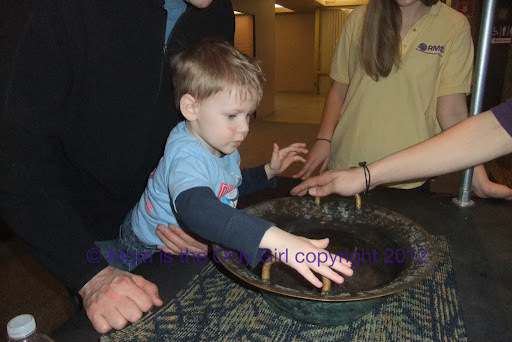 I know my boys don’t really take to things that are too loud, but these fascinated them, however, they still didn’t want to get too close or give them a try. Instead they examined them while either Uncle Craig or I were holding them, asked a bunch of questions, and then just danced while Uncle Craig played. It takes a lot of coordination to play the pipes, but not as much lung power as people usually assume. All at the same time the player is moving their fingers, managing airflow out of the bag with their arm, patterning their breathing to fill up the bag at the proper time and consistency, and listening to the pitch both of the notes from the chanter as well as the pipes leaning on their shoulders. In addition they are listening to the other pipers they are playing with, marching in time, and listening for cues from the lead piper! A good piper plays good music while also making it look easy to play the pipes! Traditionally pipers wear a kilt in a specific tartan (which represents a clan in Scotland), a sporran (the ‘purse’ that hangs around their waist and typically carries extra reeds and other emergency supplies for the pipes and piper), brogues (shoes), and wears a balmoral on their head. Their big woolly socks are called hose and are usually adorned with garter flashes. Some pipers also wear jackets. The band I was a member of only wore our jackets in colder weather. What instruments have you wanted to try, but haven’t had the opportunity to? Maybe, with the help of Hubby, we can highlight one for you if we haven’t already! Explore guitar music by making your own guitar! Simply wrap the rubber bands around the box. In the area where it is open under the rubber bands, strum or pluck the rubber bands with your finger and listen to the sound. 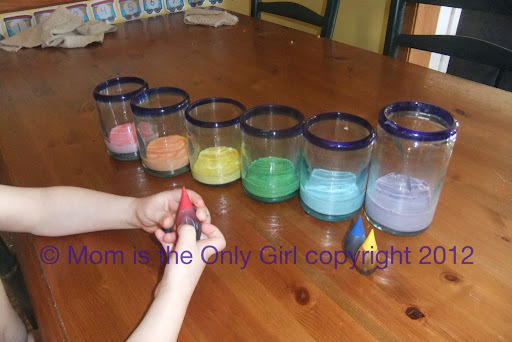 You can try experimenting with different size or widths of rubber bands. Do the different sizes sound different? Have you already tried this simple guitar making method or want to try something a little more elaborate? Try here for one slightly more complex than described above or try a cigar box guitar! There are other guitar directions on-line, check them out! 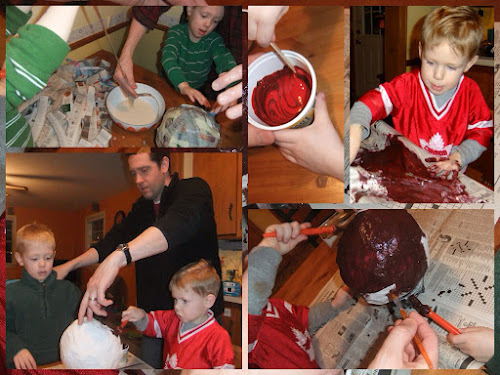 Some look like a lot of fun to make and play! Whichever kind of guitar you make, think about the construction process, the coordination of playing the guitar, even a homemade one, the science behind the music it makes (sound waves, etc) the math behind the notes. There’s so much to learn from making your own instrument, even at a young age! Cutie Pie received a guitar this past winter. He loves it, but we think Sweet Pea loves it more as he’s the one always playing it. Although the guitar is not found in an orchestra, it is still a stringed instrument and very popular, I mean we’ve all heard one, right? But did you know there are a few different kinds of guitars? Electric guitars are most often heard on the radio, classical guitars are most often heard in recital halls, and there are also double-neck guitars, twelve string guitars, ukuleles, and steel guitars to name a few. Basically, a guitar is a box with a neck and strings. The strings can be either nylon or steel. An acoustic guitar can be played with either a plectrum or with the fingers alone, but often has nylon strings. A steel string guitar can be found played more horizontal (think table-top) with a bar over the strings on the neck. This produces an altogether different sound than the acoustic guitar. The box portion of the guitar is usually hollow and makes the music resonate. If you have ever played a guitar you will no doubt have felt the vibration as the instrument was played. Of course, the bass guitar is something that has been in our house for a long time since Hubby is a string bass player and the two generally go hand in hand. The bass guitar usually has a solid body as it is an amplified instrument (plugged into a speaker). The strings on a bass guitar are thicker, making the sound lower and harder to hear, which is one reason this instrument is generally amplified. We also have a slide guitar, but it is in need of repair, so we haven’t let the kiddos see it yet. I encourage you and your kiddos to go to a music store and explore. Many workers in a music store will allow you to try instruments and ask questions. Tomorrow I’ll share how to make a simple guitar and a couple of links to more complex guitars to make! This is a repost of a simple color game! Since this was posted last year we’ve played this game in stores with black and white floors, too! Our church basement has a color pattern on the floor. One Sunday I was delayed after church and they were getting antsy. 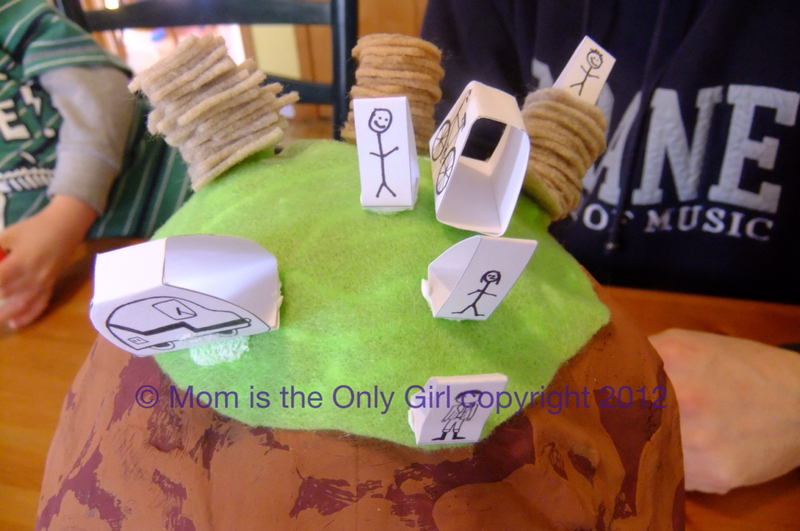 I found them playing a game that Hubby had created. He’d call out a color and the boys would have to jump to it touching as few other colors as possible. They had a blast and wanted to play again the following Sunday. 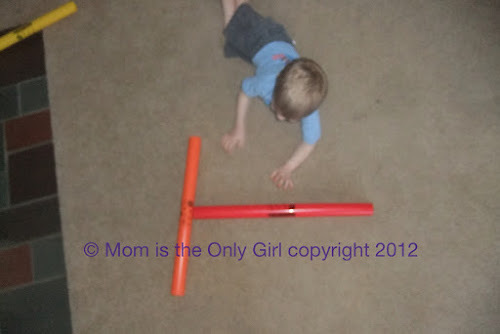 I love simple games that keep our boys occupied! Sorry I didn’t have a post on organizing last week. I was busy trying to revamp my blog. I’m well on my way, just a few finishing touches! I have been spending a lot of time outdoors with the boys, which has led me to thinking about their outdoor toys. Right now they are still in a huge heap in our shed because I’m not totally convinced this sunny 60+ degree weather is here to stay. I mean, after all it is only March and in this area of New York State it normally isn’t this nice out for a while yet! Suffice it to say, I’m starting to wonder about how to keep all of the toys in the garage and organized this summer! 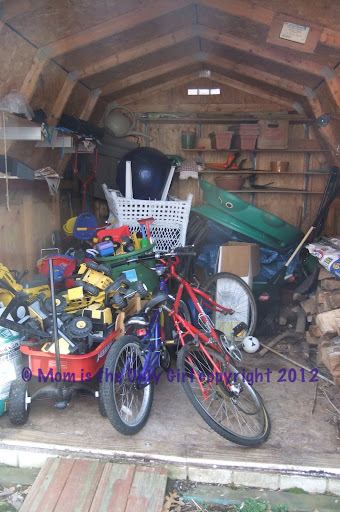 We have little shelving as it is a very narrow garage (barely enough room for a passenger to get into the car in either stall) and as you can see the shed is quite full when the toys are in there, which is not an easy way for the kids to get to their playthings or for me to get to the mower or garden tools! So, I’m looking for your organizing ideas for my boys’ toys! Any and all ideas are welcome! Do you have a Cuttlebug or something similar? For some texture fun, get it out! Have your child feel the textures on each side of the folders. Are they smooth? Bumpy? 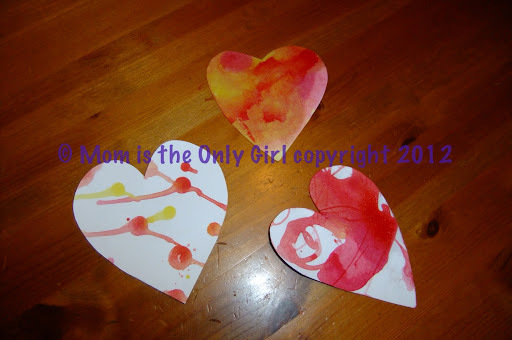 Help your kiddos make a texture on some paper or cardstock. Ask them what they think will happen to the paper. My boys thought they would make the smooth cardstock bumpy when we used the machine with a texture folder. We ran the cardstock through and, sure enough, the cardstock was made bumpy (texturized)! This took some coordination, but the boys loved being helpers! We experimented with texture like this initially when we were learning the letter T, but have had fun with it several times since then! 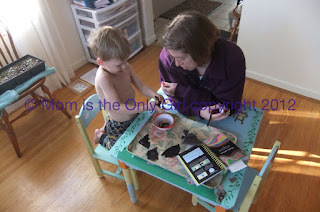 Wrap the rolling pins in rubber bands and the textured cloth and poured some paint into the trays. 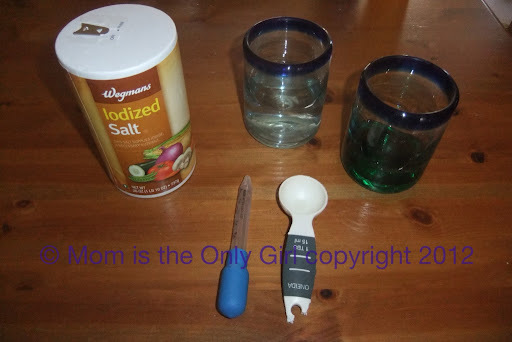 Do the same with the sponges and utensils. 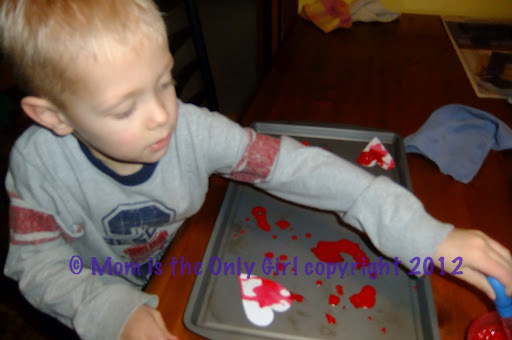 Show them how to pull the fork tongs through the wet paint to make a design. My kids love making textures this way! 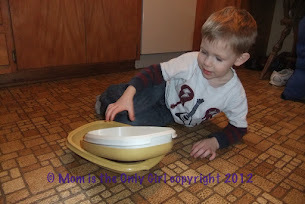 Sweet Pea was helping me put away the dishes be morning and found this 3-part microwave steamer. He spent a good half hour investigating it. He tried to fit the pieces together in every way imaginable! Sometimes I forget how the simple things fascinate little guys! The concentration, coordination and logic involved in this play were the perfect combination to capture his attention and kept me watching his exploratory play for almost the entire time he played with it! 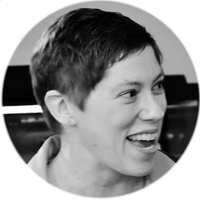 Aunt Lori used to be a public school music teacher and is a cellist. 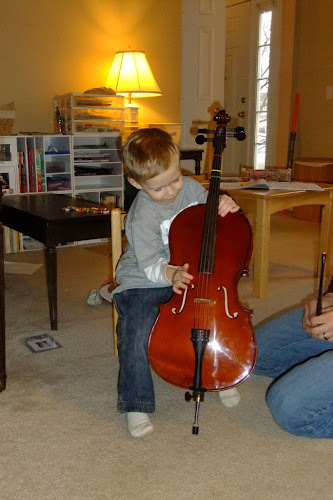 Her daughter has an interest in the cello, too, and now has a small cello to take lessons on! Lucky for Sweet Pea it’s a great size for him! He was tickled pink to see it and get to play it! He did so much better on an instrument the right size for him! Have you looked into taking your child to an orchestral performance? If your school district teaches stringed instruments there will most likely be school concerts this month and next (at least there are here!) Also, if you live near a professional orchestra you might find some daytime concerts just for kiddos. Here in the Rochester, NY area there are OrKidstra concerts once a month on a Sunday afternoon as well as Tiny Tot concerts coming up later this month! Often at the concerts specifically for kids there is an instrument petting zoo where your child can touch and try to play different instruments. Are your kiddos fidgety with their hands? Or maybe you just like to make them work for their treats? (kidding!) Or maybe you just need something simple that doesn’t require anything fancy to set up so you can finish that project? 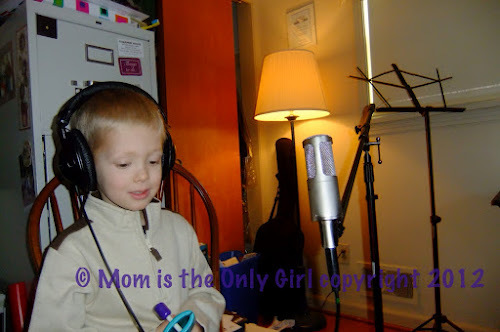 Since Hubby is a musician we have a lot of recording stuff in our computer room. 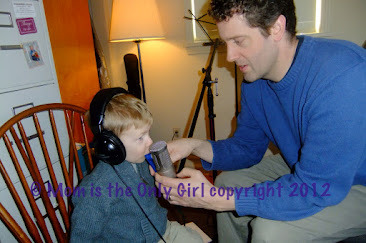 Hubby had the wonderful idea to record Cutie Pie singing for his birthday! Isn’t he cute with those huge headphones on? Cutie Pie actually loves to sing this particular arrangement of “Hot Wheels” a song he heard briefly on a YouTube video and can’t quite remember correctly. 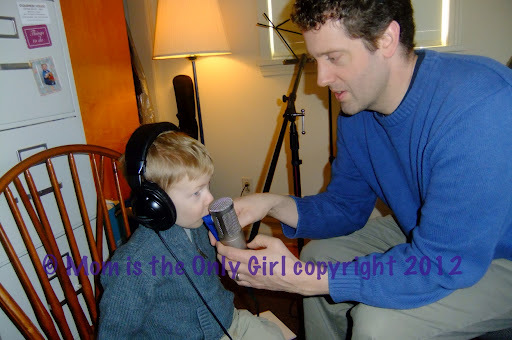 Hubby collaborated with him, discussing what instruments Cutie Pie should play, what Sweet Pea should play and what Hubby should play. The end product was great! Cutie Pie is very proud of his song when he hears it – and asks for it often! 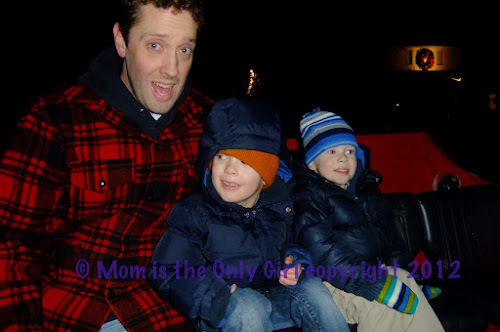 The boys love to sing, dance and play instruments. We’ve had the idea of recording them for a while, but for some reason we haven’t done it until now. Seeing them hear their creation at the various steps in the recording process and then at the first moment they heard the final song was priceless! I think this was the best instrument petting zoo opportunity yet! Does teaching manners to children really work? 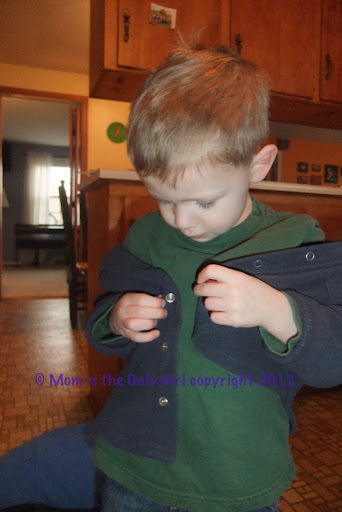 Sweet Pea is trying to be such a big boy…trying to snap his fleece shirt up on his own, wanting to make his own hot cocoa, pulling his socks on his feet, getting his own water to drink. I’m mostly loving that he’s trying to be more independent and trying things even if he’s not sure his idea will work. Cutie Pie tends more toward not trying something if he’s not sure his idea will succeed. Sweet Pea is much more ready to say “I do it on my own” whereas Cutie Pie is more ready to ask for help. Both are OK – to an extent! According to Parents.com 3 year olds should be able to get dressed, feed themselves, be willing to make new friends, start things, do basic chores, make simple 3 word sentences and more. Every day I see Sweet Pea growing, not just physically, but mentally and emotionally as well. I look to magazines like this just for an idea as to where he should be compared to other kiddos, but I don’t expect him to be right in line with them. for example, he’s very small for his age, but can outclimb and outrun most others his age. He also talks in complete sentences of much more than 3 words, and use pretty advanced vocabulary compared to other 3 year olds he is around. What I’m saying is I’m glad Sweet Pea is who he is, that he wants to grow and discover on his own. 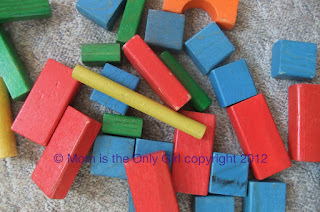 That he is learning through play and the processes of repeating things until he gets them right. I understand in some ways he is more advanced than his peers, but in other ways he’s lagging behind them. All of this is OK because he is becoming exactly who he should be. Life would be a little more mundane if he were like his peers in most ways. I promise myself every night before I go to bed, when my mind just can’t take another “I do it on my own” that he is becoming a person and needs to explore, succeed and fail in order to grow. Do you? Sometimes I just need to occupy one of the boys for a while so I can finish something up, but they want to be right by me. 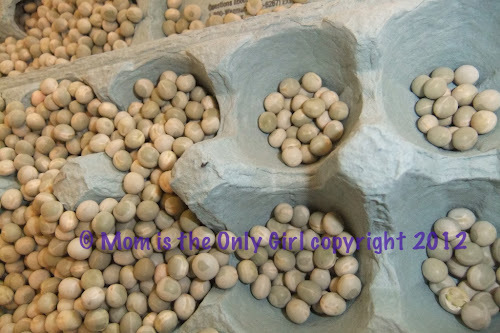 This simple activity is perfect and there is very little prep or cleanup, unless your grocery shopping helper grabs a bag of peas rather than beans like mine did – then you might be stepping on peas for a week! In a tray on the table I set the peas in a bowl along with a spoon, an egg carton and sometimes a cup. 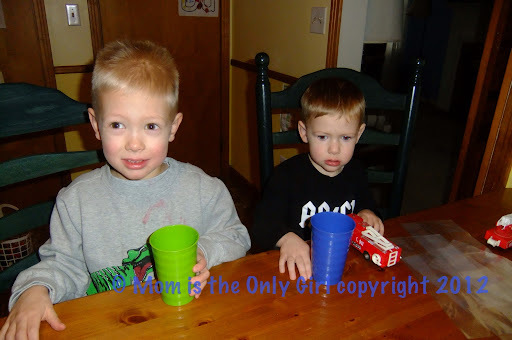 My boys create their own activity to occupy themselves…scooping, pouring, counting…sometimes I give them many peas, other times only a handful. Every time it’s a great occupier! Since typing this up I’ve also seen this on several blogs…I’m not original in my thinking! He’s learning the process of making something. He’s learning how much a mug can hold. 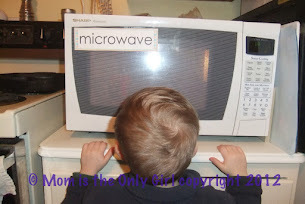 He’s learning his numbers by pushing buttons on the microwave. He’s learning about hot and cold, experimenting with his sense of taste. He’s also gaining a sense of accomplishment, pride in completing something. He’s exercising independence, but within limits I set for him. And yes, I am supervising the whole time. Sweet Pea is definitely different than Cutie Pie, and this is evidenced many ways including this. Sweet Pea definitely learns by doing! I wish I had some fun little blog post for today, or even a thought out post at all! I haven’t been very good the past couple of weeks with my boys having colds, just taking posting a day at a time and not getting ahead at all. Today we had a visit to the Dr. and my littlest has a double ear infection. Poor guy! We really just can’t get ahead! So today I’m just popping on to wish you a happy day! Happy Valentine’s Day my guys! 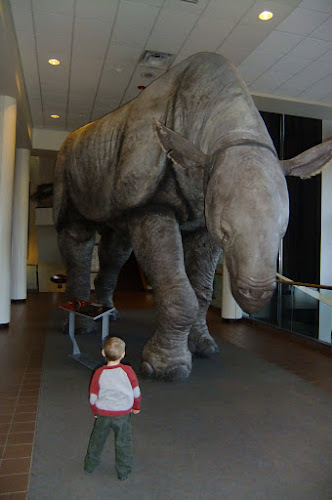 Rochester Museum and Science Center currently has the traveling Extreme Mammals exhibit from New York City’s American Museum of Natural History. Unfortunately photography in the exhibit itself is not permitted, however, in their lobby is a mamoth creature that my youngest calls a ‘camel’. He calls another mammal in the exhibit a camel as well, which much more closely resembles a camel! For reference, 3 year old Sweet Pea can just barely see the writing on the information table you see under this creature! It’s incredible to think mammals like this once roamed the earth! Within the exhibit there is also an incredibly small mammal that resembles a mouse, however, it is breathtakingly tiny! What an interesting exhibit. I would recommend seeing these mammals if nothing more than to take in the extremes. It is unfortunate that a fee is required to see them, much greater than I expected for non-members of the museum, as I have several friends who would have loved to take their kiddos but could not afford to. 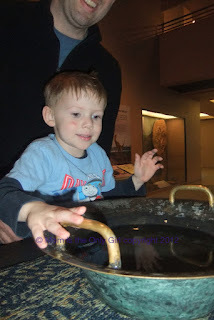 I also would have loved to have a take-away information sheet to do further research with my boys as they were extremely interested in several of the mammals, but did not locate one within the exhibit. If you are in this area and have the chance to explore this exhibit before it leaves RMSC in mid-April I’d love to hear your opinions on it! Please. Polite. Pour. Punxsutawney Phil. Penguin. Pepper. Paste. Pretty. Plane. Plastic. Pasta. Pen. Social/Emotional: Field trip to Play at The Strong National Museum of Play. Cutie Pie and Sweet Pea counted straws this week. Cutie Pie also helped me measure and cut index cards to 1″ x 5″ to make straw Planes! Straw Plane Directions: Take a straw and 3 pieces of 1″ x 5″ card stock (we used the index cards). Tape two pieces end to end to make a circle, tape this to one end of the straw. Tape the remaining piece together to make a circle and tape that to the other end of the straw. Voila! A straw Plane! 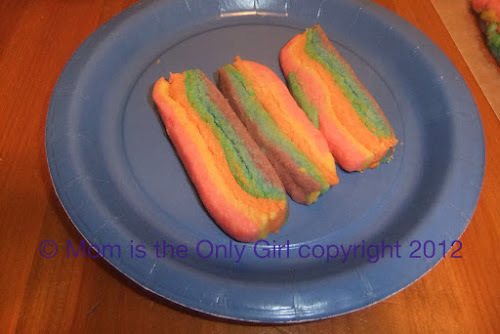 The boys loved these! 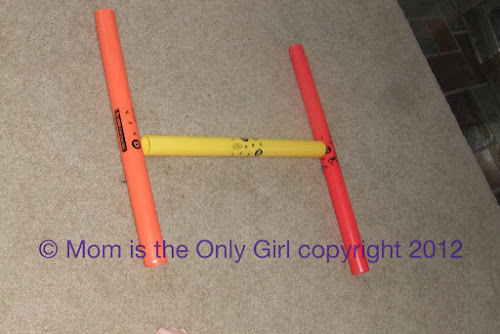 I found this idea on All for the Boys. 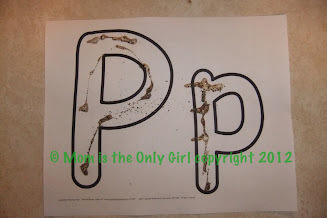 Literacy: Cutie Pie’s name starts with the letter P, so he’s pretty good at writing this letter. Sweet Pea not so much. 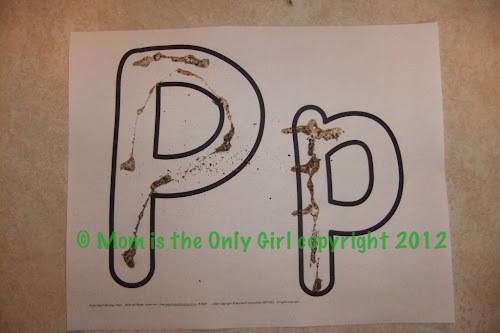 He had fun using a glue stick inside the letter P outline I gave him. 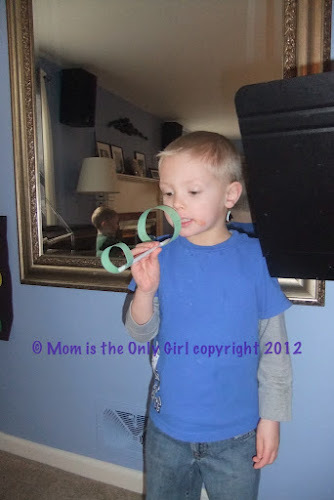 He really enjoyed this, but got a little carried away with the glue stick and used the entire thing! (Sticky boy!) Cutie Pie helped decide on the thing starting with P that we should stick to our letter and he chose Pepper! He also came up with that little list of P words up there! We made groundhogs out of construction paper hearts. I got this idea from here. Of course we named him Punxsutawney Phil since we made him on Groundhog Day! 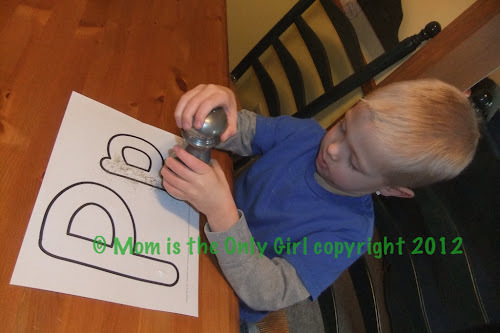 Cutie Pie traced his letter P and practiced writing it on the chalkboard. Sweet Pea picked up lots of peas from his tray while scooping in his pea-filled sensory box! One thing I found, but that I wasn’t able to print out until after P week was over (but is really fun now that we have played!) is a Penguin game found here! The kiddos received a new book for Christmas, Usborne Activities 50 Science Things to Make and Do, and we love it! Every project to try is laid out very clearly with pictures and simple instructions. At the end of each is a section called “What’s going on?” and explains the science details of what you just did! It is recommended for ages 9+, but my kiddos love it and have understood the simple science concepts of each project so far! The first experiment we chose to do was the Chiming Fork. Objective: Find out how sound vibrations work. Cut a length of thread as long as your arm. Tie the middle to a fork and wind the ends around your index fingers. Swing the fork so that it gently hits the table. What do you hear? Next, touch your index fingers to the flaps in front of your ear holes. Swing the fork gently against the table again. What do you hear? Cutie Pie observed the fork initially made a “clunk” noise, just like the experiment described. The noise I heard when putting the thread to my ear was the same as when the fork hit the table initially. Cutie Pie wonders if the weight of the thread would change the outcome of this experiment, or would affect the pitch of the noise heard when the thread is held close to the ear. We plan to do this experiment again to test his theories. 50 science things to make and do was given as a gift by a family member. I have not been compensated in any form by the publisher or author of this book. This review is based on my and my family’s honest enjoyment of this book. Cutie Pie for some reason had been asking a lot about coconuts lately and whether they had juice in them. 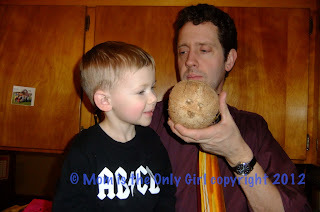 One day when at the grocery I decided to get one and examine it with the boys! it wasn’t! Hubby to the rescue! 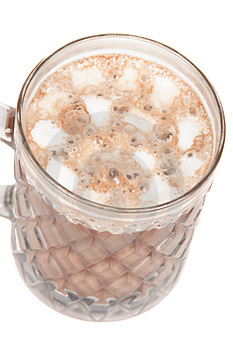 All the while we talked about what it might taste like. As you can tell from the expressions, coconut milk was not delicious! 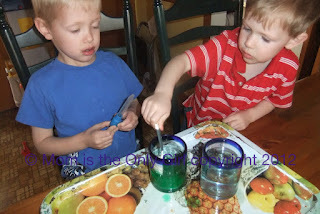 The boys had a great time with this experiment! The initial examination: (The exterior of) the coconut is rough. It is hard, maybe so animals can’t eat it. 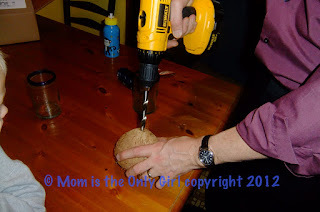 The hypothesis: coconut on cakes is sweet and dry so this coconut will be sweet, but maybe the other stuff (flesh) will be wet but sweet since there is milk in it. 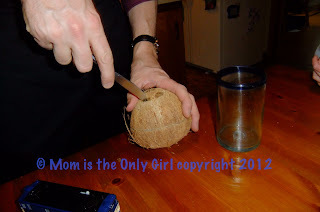 The conclusion: Cutie Pie’s fascination with coconut has ended. He admits he still likes the dry coconut on cakes. The question: What new things have you tried lately?